Shoulder pain is common in sport and can be either acute (sudden onset) or chronic shoulder pain (gradual onset). Sudden onset shoulder injuries usually occur through direct impact or trauma and can become chronic if they are not diagnosed and treated properly. Chronic shoulder injuries may develop from overuse, wear and tear or degeneration of ligaments and tendons over a long period of time. Sudden onset or acute shoulder injuries often occur from a fall onto an outstretched arm, from a direct impact, overstretching or overloading. A rotator cuff strain is a common cause of acute shoulder pain in sport, especially in throwing and racket sports. It is a tear to any of the four ‘rotator cuff’ muscles in the shoulder. Symptoms include sudden shoulder pain which may radiate down into the arm, with a feeling that something has torn. Rotator cuff strains can range from mild to very severe. Immediate first aid applying the PRICE principles is important followed by a gradually rehabilitation and strengthening program. AC joint separation or AC joint sprain is a tear to the ligament that joins the acromium and clavicular bones at the top of the shoulder. It is usually caused by a fall onto an outstretched arm and can range in severity from mild to a complete tear of the ligament. Severe pain and swelling will be felt at the time of injury and will radiate throughout the shoulder initially, but later on, the pain will be more localized to the bony part on the top of the shoulder. Immediate first aid is important and strapping or taping the shoulder is usually recommended to prevent long-term deformity of the shoulder. Read more on AC joint separation. A rupture of the long head of biceps muscle is a tear or strain of the long tendon of the biceps muscle which originates from the shoulder. It is more common in older athletes. A sudden sharp pain is felt at the front of the upper arm/shoulder. There may be pain and swelling over the front of the shoulder joint. Contracting the biceps muscle against resistance is likely to be painful and in particular, lifting a straight arm up forwards against resistance is likely to be painful. Read more on rupture of the long head of biceps . A Clavicle fracture is also known as a broken collarbone. The bone can be fractured by a fall. Symptoms include severe pain in the collarbone, sometimes with swelling over the area and a bony deformity is often seen. If a broken collarbone is suspected then seek medical attention immediately. Read more on Clavicle fracture. A pectoralis major tendon strain is a strain or tear of the powerful pectoralis major muscle at the front of the chest. It is used to rotate the arm inwards. Its weak point is where the tendon attaches to the arm bone, and a strain or rupture can happen here when it is put under stress when weight training for example. Symptoms include shoulder pain and swelling at the front of the shoulder. Read more on pectoralis major tendon strain. View all acute shoulder injuries. Gradual onset shoulder pain or chronic shoulder pain develops over a period of time. The athlete may not have known the exact time of injury which could have been niggling away for a while as they train through it. Rotator cuff tendinopathy is a degenerative condition affecting one or more of the rotator cuff tendons in the shoulder. 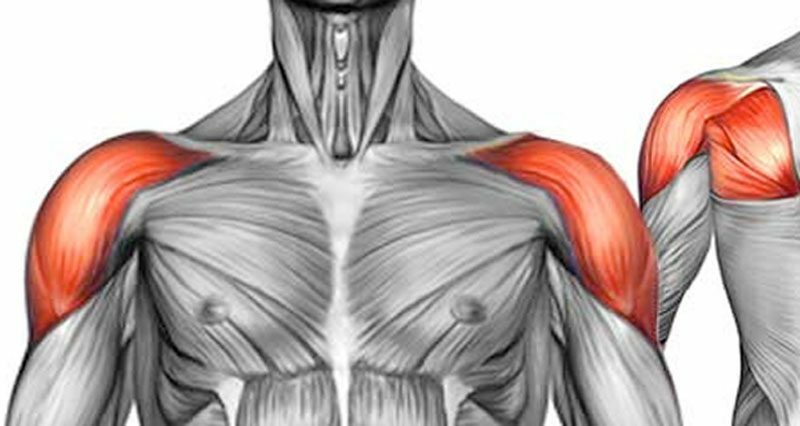 The shoulder pain is often present when resting and may be exacerbated by lifting and moving the arm above the shoulder. The tendon will probably feel tender and there may be a creaking feeling when the shoulder moves. Read more on Rotator cuff tendinopathy. Frozen shoulder causes pain and restricted movement in the shoulder joint. It is normally only seen in older people, with no specific cause. There are three phases to this injury. Initially, the shoulder will ache, with the pain becoming more widespread and worse at night. The joint will then start to stiffen and the pain may limit daily activities. Eventually, with treatment, the joint will begin to loosen up and pain will ease. Read more on Frozen shoulder. Glenoid labrum tear occurs when the tissue lining the shoulder joint socket tears, creating shoulder pain and weakness. The shoulder pain often cannot be localised to a specific point. 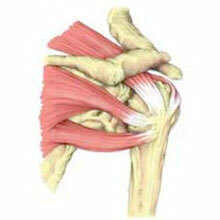 This shoulder injury is often caused by repetitive movement such as overhead throwing. Resisted flexion of the biceps and moving the arm behind your back may reproduce pain. Read more on Glenoid labrum tear. Subacromial bursitis has similar symptoms to Supraspinatus tendinitis. The injury occurs when the bursa (sack of fluid over tendon to facilitate movement) become trapped. It will cause pain and weakness in the arm, particularly when it is lifted sideways through a 60-degree arc. Pain may also be felt when you press in at the inside front of the upper arm. A winged scapula is a symptom of another condition, rather than an injury itself. It is where the shoulder blade protrudes out on the back, rather than laying flat against the back of the chest wall, and this can be painful. It can be linked to poor posture, which is quite common with many people sitting at desks all day! Read more on Winged scapula. All acute and chronic shoulder injuries should be treated using the P.R.I.C.E. therapy principles of protection, rest, ice, compression, and elevation. This should be applied at home for at least the first 2 – 3 days. The use of a compression support to the arm or elbow can help reduce swelling. Compression is not quite so easy on the shoulder joint but an elastic bandage can be used to wrap and support the shoulder joint in the early stages. Keep the hand elevated above heart level whenever possible to help reduce swelling in the hand due to the effects of gravity. This is best achieved using an upper arm sling. In order to thoroughly assess any injury, a sound knowledge of the anatomy of the area is required. These examples are for information purposes only. We highly recommend seeing a sports injury professional or doctor to receive a full and accurate assessment of your injury. The assessment is split into subjective and objective. Subjective assessments gather information about the injury history, whilst objective assessments examine the shoulder itself. Read more on assessing & diagnosing shoulder injuries. After an injury, shoulder rehabilitation exercises usually begin with mobility exercises. Then, when pain allows, isometric or static shoulder exercises are used to begin strengthening. These then progress to dynamic ones with a resistance band or dumbbell weights. Exercises to stabilize the shoulder girdle, including the shoulder blade, as well as any deficit in spine function, is important to prevent future injury. Later on, more sports-specific or functional exercises are done in preparation for returning to full training. Read more on general shoulder rehabilitation.